I picked this volume up without enthusiasm, having failed to be enthused by any of the author’s previous works, good though they are as practical manuals. But Bluewater Fly Fishing is different; this book is inspiring. I knew it was going to be something special the moment my eye fell on the moody underwater photograph of a Pacific Sailfish opposite the title page. Three pages in, the author had my complete attention. Trey Combs is hardly known in the UK, although he is a major sporting personality in the US. As such, he travels. Bluewater’s basic currency is exotic locations, taking the reader from the Queen Charlotte Islands off British Columbia to the Bismarck Archipelago, New Guinea, in three breathless chapters. Then, there are the fish, lots of them, in sizes and speeds that most of us wouldn’t dare to imagine: dorado, sailfish, four species of marlin, albacore, half a dozen varieties of tuna and, of course, the mighty wahoo. There are wild runs, spooled reels, smashed tippets, broken rods and damaged egos here. Overall, it gave me the wish to fish. 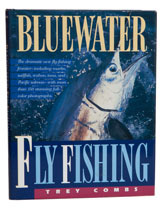 The dust jacket describes Bluewater as the first major work devoted exclusively to big game fly fishing, and as such, it deserves to collect every accolade. The photography is superb, the text outstanding, and I doubt that there will be a finer tribute to blue water fishing for many years to come. You may never hold a fly rod in your life, you may have no intention of taking to the ocean, but if you are a fisherman, buy this book and dream.